Why Won’t They Redesign These Websites? It’s the 21st century. Do you know where your Web site is? It seems like a silly question, but where is your Web site exactly? Languishing in the pits of circa-1998 “frame-based” ugliness, or thoroughly enjoying all of the simplicity and elegance that currently makes up the Web 2.0 world? Now, every Web site is different, and Web design is more of an art than it is a science. There are elements to Web design you can study (such as heat maps, navigation, and conversion rates), but there’s one thing no one can really put a label on: that all-important first impression. Does your Web site pop? Do people remember it? Do they enjoy the novelty of just looking at it those first dozen visits? Obviously, some Web sites have different needs than others. Wikipedia isn’t selling anything, so it doesn’t need to direct your eye to any “purchase now!” buttons. Drudge Report is all about the headlines – it might actually disappoint me to have to click on individual news categories. And some Web sites fail in unique ways, as well. Why? Some designers don’t have the time. Others don’t have the money. And some just plain don’t care. 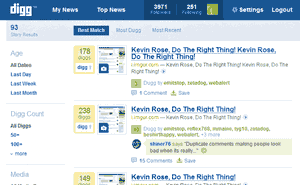 Update, 9/3/10: The Digg v4 release flopped. Despite the implementation of early fixes to get the new release off the “fail trail,” the new Digg suffers from a design intended to emphasize corporate publishers-exactly what the Digg audience hates and deemphasize powerusers-the social media site’s influencers. The new design infuriated loyal diggers, sending them into another revolt. Holy Lots of Stuff Going On, Batman! Can you imagine an Internet rookie trying to find their way through this labyrinth? Try re-designing the checkout process – which narrowly navigates through a sea of prompts and other offers – and downplay all of the cheesiness. You’d think a company that sells domains and design services would look less like a Bacon and Cheese Gordita and more like a Web site. The only reason I can tell DMOZ isn’t MS-DOS is because it’s in color. For such a powerful and highly-thought-of directory, there doesn’t look like there’s any reason to visit it other than to check if your own Web site is listed. Spice this up with, at minimum, a Google-type logo at the top and center, and maybe explain what’s going on here. Oh, is this Aintitcoolnews? I thought I was clicking to “Joe Mack’s News Shack.” The Drudge-like headlines may offer a reason for people to click to the site, but in all honesty, the thing’s an eyesore. The colors don’t fit well with each other, and the site takes up the whole screen. Simplify. Also, put the site back in the middle of the screen. What’s the white space floating around on the right for? Can I do anything with it? My eyes are lead to the left and top, but there are more elegant ways of doing that. I must admit that I have a weakness for the Drudge Report. People love reading big headlines, even if the headlines simply read “SLOW NEWS DAY HITS AMERICA.” Even so, Drudge’s famous Spartan design could use a bit of a sprucing up. Don’t take away the simplicity, but give me something that makes the site not feel like a Notepad document. What might that involve? Maybe an unobtrusive menu near the top – somewhere to navigate other than the various stories themselves. For those Drudge users who like being able to click away, realize that millions of people visit Digg for the same purpose and it doesn’ t look like an empty 1920’s newspaper. Danny Sullivan is one heck of a search engine expert. No one questions Danny Sullivan’s rightful place as the godfather of search. 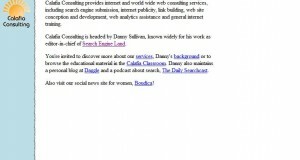 I know search engines like text, but, without the knowledge of who Danny Sullivan is, you’re tempted to click backwards (or better yet, to searchengineland.com, one of the most informative and up-to-date search engine resource sites out there, also Danny Sullivan’s site). There’s no design meat at Calafia. I bet Danny created this in Notepad a very long time ago. And the logo looks like it was created in Paint. Give us more, please. I could have shown you Matt Cutts’ blog, but it’s just a standard WordPress cookie cutter WordPress theme that used to be used all over the place. He’s used this same design ever since anyone remembers. Might a change be in order? I wanted to show you the actual MattCutts.com because this basically typifies the whole site. You know it’s Matt Cutts, and he offers opinions on Gadgets, Google and SEO. Maybe Matt wants it this way, but there’s nothing to associate with Cutts himself – there’s no brand going here, except maybe the point that Google doesn’t care what your site looks like. Okay, maybe Google doesn’t, but I do. 1997 called, it wants its template back. Mendosa.com is an excellent site for anyone who is interested in learning how to live life with diabetes. It is not a site I would be proud to link to, based on the design alone. Maybe it’s got some great content, but unfamiliar readers might assume the content itself is outdated because of how the site looks. Switch to a medical all-white background, take out the huge box ad, and slim the site template to two-thirds of the screen itself. Then, we can start talking. I’m a little conflicted on MSN. I know that it tries to be a “start page” type Internet portal that introduces you to the Web, but there’s so much going on that sometimes you want to see the little Google bar again. With MSN, their search bar is a bit of an afterthought – it gets some primetime location up at the top, but it looks like the type of search bar a lot of other sites would have somewhere on the top of their pages. With Google, you know why you go there. When Logo Redesigns go BAD! GoDaddy WebSite Tonight Review: An Ephemeral Task? wow, some of these site definitely need an update! Web designers are missing out on some big clients here. I don’t agree with uwe above me who mentioned Google… There are some websites and brands that simply work and are future proof. Google is one of them. Making small occasional changes can be great for SEO so all sites should be updated regularly, but this can be as simple as blog posts. As far as site re designs go, I think every few years is more than enough, just to keep up to date with any new technologies such as CSS3 etc. The bluehost is pretty oldschool, but hey at least it has a kind of logical structure. HA!! Great list and agree 100%, nice to read article..!